ABOARD THE CHARLES DE GAULLE - U.S. Navy Lt. Patrick Salmon is getting ready for another day at work, strapping himself into the cockpit of his strike jet and roaring off this French aircraft carrier for his daily attack mission against Muammar Qaddafi's ground forces. He'll be launched into action by Kyle A. Caldwell, another U.S. Navy lieutenant who operates the flattop's catapult systems. When Salmon is ready to set his plane back on deck, yet a third U.S. Navy lieutenant, Philip Hoblet, will be standing by in a French rescue helicopter, hovering just off the ship's bow in case any of the returning pilots are forced to ditch into the sea. The United States, which originally led the Libya campaign, has been steadily reducing its role over the past two weeks. On March 31, it handed over command and control of the international campaign to NATO, the North Atlantic Treaty Organization, and shortly after that it ceased all attack missions over Libya  setting of a search by NATO for more planes capable of carrying out precision strikes against Qaddafi's forces. NATO said Friday that the U.S. still flies one-third of the Libya operation's missions. But that refers to surveillance and refueling missions, not to attack flights over Libyan territory. But even though the U.S. has withdrawn its forces from the front lines of the NATO campaign, a handful of Americans serving on this French navy carrier remain at the forefront of the action. They are members of a little-known French-American naval exchange program in which U.S. officers spend time in the French navy  known as the "Marine Nationale"  and French officers spend time in the U.S. navy. "Because French carrier pilots are trained in the United States, this helps a lot with standardization of procedures," said Cmdr. Matthew Hogan, 44, Grass Valley, California. "We're very comfortable operating with each other." Hogan, who is nine months into a two-year posting at the naval base of Toulon in the south of France, serves on the flattop as a staff officer for Rear Adm. Philippe Coindreau, commander of the French fleet conducting the airstrikes against Libya. The carrier, known in the navy by its nickname "Le Grand Charles," began reconnaissance flights over Libya on March 22. Attack missions followed almost immediately, and the ship has acted as the tip of the spear for NATO s aerial campaign ever since. France currently has only a single carrier in its inventory, while the U.S. operates 11 of the floating air bases. 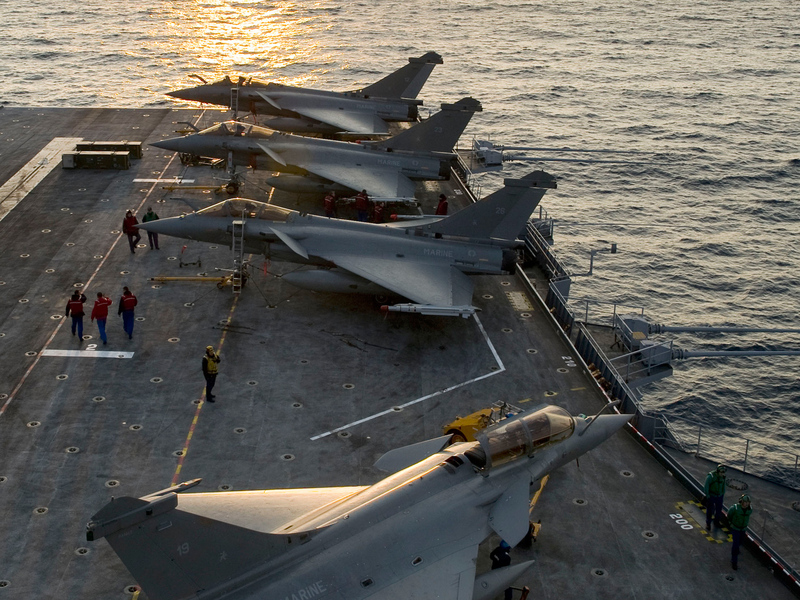 The French therefore long ago decided it wasn't cost-effective to organize a training program of their own for their pilots, but rely instead on U.S. Navy training. French naval aviators and some support personnel regularly head to U.S. Navy bases in Mississippi and Florida to learn carrier operations. The four American officers serving aboard live in or near the base in Toulon, but only Hoblet has his family with him. The others say they spend too much time at sea to make it worthwhile for their wives and children to relocate to a foreign country. The Americans received their basic language training at a Defense Languages Institute in Monterey, California. Although they achieved fluency in French, mastering the intricacies of colloquialisms and idioms remains a challenge. Caldwell, 38, of Colombia, SC, remembers his confusion when his workmate told him: "Ne faut pas pousser la grand mere dans les orties"  literally "don't push your grandmother into the nettles." The English equivalent of the phrase is "don't try so hard." "So when we're not working, we're mostly studying French," he said. Working in another language on board a carrier involves the additional complication of communicating in intensely noisy conditions. Jet engines roar, cables clang across the deck, catapults thump as they heave planes aloft and lifts whine has they move planes from the hangars to the flight deck. But the four have received high praise from French officers for their language abilities, their performance and their camaraderie. Caldwell, who has worked on several U.S. carriers, said the similarities between the two navies outweigh the differences, and said the major distinction was the number of sorties he handles a day. "On U.S. carriers we trap about 160 aircraft a day at sea, but here it's just 35-40 a day," he said. "Also, on U.S. carriers we're able to launch and trap aircraft at the same time, but because of the shorter size here we need to close the carrier deck for each operation."